It was just a matter of time when mighty Microsoft will release their operating system in mobile world. For now the field of mobile and tablets applications was majorly taken by big two, Apple and Google with their operating systems iOS and Android. But now after Microsoft released their own tablets and smartphones, Lumia phones to be more specific, which are getting more and more popular, especially in 2015. 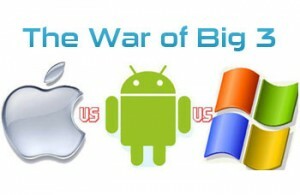 Because of Windows operating system running inside them which is more opened and loved by people then first two because of Windows past success with desktops operating systems, Apple and Google should really get worried and make a plan if they want to keep their piece of fame in mobile apps world. Now it will be interesting to wait and see what will happen and will the Microsoft win a war again against Apple like it happened in golden era of battle between these two giants. We don’t need to underestimate Google for sure because we don’t even need to explain why. This is gonna be a real “World war” in mobile apps dominating battle, and the one who wins and manage to attract users with some new innovative ideas and tools will get a huge profit from nowadays worldwide spread of mobile phone users and internet network. For now let’s just sit and wait for Microsoft’s next move and as soon as we get some new we’re gonna announce it here in this post so stay tuned guys! Check this paragraph often if you’re interested to know what will happen next and see you soon!